Check out http:// dieseltailgate.no-ip.org/ for tons more information about the tailgate. We will be serving a huge variety of German fare and tailgating favorites. We also have some fun activities planned! If you think you may be in town, and didn't receive an evite (or didn't respond - you know who you are) let us know a.s.a.p. so we can plan accordingly. As feared, the Parking Committee has reared it's ugly head and has altered the parking maps. 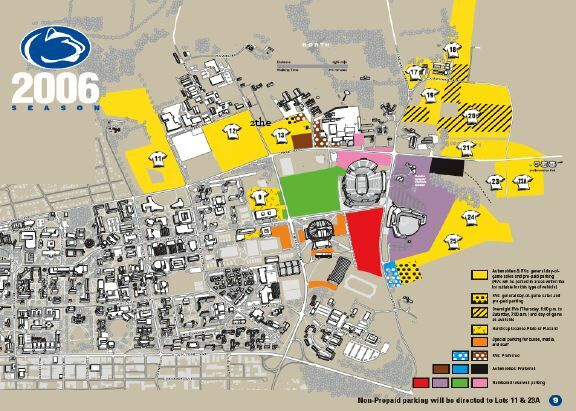 Lot 13 is still available to Yellow Parking (note - only pre-paid) - but a large portion (ie, where we've been tailgating the last few years) has been sectioned off for Blue (prefered general admission) parking. 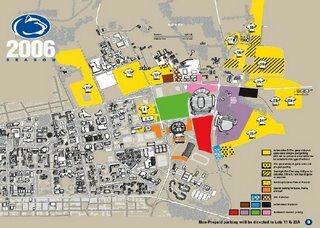 So there will be changes if you don't have a parking pass - AND our location will be changed as well. For the Akron game the new "blue" lot did not fill up by game time - but the yellow lot(s) looked pretty packed. We chose alternative parking (ie Eisenhower parking garage) for our tailgate due to the rain, but we'll report back after youngstown state with a first hand account of the new system. The evites for our Oktoberfest tailgate vs Northwestern on 9-30-2006 were sent today. We will be tailgating with Madeline and Suzanne location and time TBA. If you did not get the evite, please let me know.